We appreciate your dedication to veterinary excellence and your commitment to helping educate pet parents about the benefits of a quality pet health insurance plan. We value your partnership and we'll work closely with you to help you achieve your practice goals. 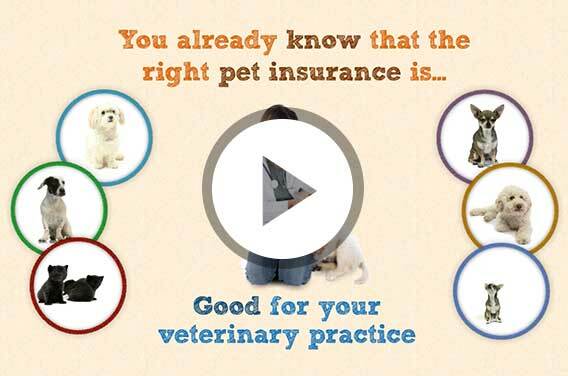 Pet Insurance companies offer very different pet health plans, coverages, and premiums. Of course, that doesn't mean a quality pet health plan can't be affordable. You can help your customers make smart, informed decisions about selecting the right pet insurance for their pet and budget. To request Healthy Paws Pet Insurance & Foundation brochures, simply submit your information below. If you would like to learn more about our #1 customer-rated pet insurance, enter a date and time that would be most convenient for a 15 minute webinar. We'll follow-up by email with a confirmation of your requested time. If you don't find the answers to your questions below, you can email us and we'll respond as quickly possible. To learn more about our pet health plan, visit the Healthy Paws FAQ page. 1. Why is Healthy Paws top-rated with pet parents? It's not complicated. We created a very affordable, comprehensive pet insurance plan and then backed it up with an unparalleled commitment to customer service. From a pet parent's perspective, they clearly understand what is covered and what is not covered. They also love the fast claim reimbursements (often in 3 days or less) and compassionate interactions with the Healthy Paws team. Below are some key differences between Healthy Paws and other pet health insurance providers. Coverage for expensive hereditary and congenital conditions? Healthy Paws does not restrict coverage for hereditary and congenital conditions. Many pet insurance companies exclude or limit expensive hereditary and congenital conditions. Reimburse policyholder on the actual veterinary bill? Yes. Healthy Paws pays on the actual veterinary bill. Other companies will use a benefit schedule or use the term "usual and customary" which may substantially lower reimbursements to the pet parent. Any plan limits? Healthy Paws is the only company to offer unlimited annual & lifetime payouts with an annual deductible. No caps on claims. Ever! Most companies place per incident, per condition, annual or lifetime caps on claims. This lowers the reimbursement to the pet parent. What do their customers say about their service? We work hard to earn the #1 rating from pet parents on leading review sites. We're committed to delivering the best pet insurance plan on the planet! Other companies simply have complicated plans that make it difficult for their service reps to achieve our standard of customer service. Healthy Paws offers one pet insurance plan covering everything that matters including injuries, illnesses, genetic conditions, and emergency care. If your pet needs treatment for any accident or illness, and it's not a pre-existing condition, you're covered. It's that simple! *Choice will vary depending on pet's age. Unlimited annual & lifetime payouts with no per incident, per condition, annual, or lifetime limits on claims. See any licensed veterinarian including specialists and emergency animal hospitals to treat any accident or illness. Lifetime coverage for dogs and cats enrolled before the age of 14. 15 day waiting period for accident and illness. 12 month waiting period for hip dysplasia. Pets less than 6 years of age must have had an exam within 12 months prior to enrollment otherwise they must have an exam within 15 days from the enrollment date. Pets 6 years or older must have had an exam within 30 days prior to enrollment otherwise they must have an exam within 15 days from the enrollment date. Veterinary Office Fee or Exam Fee. Preventative care like annual exams, flea and tick medications, and spay/neuter surgeries are excluded from coverage. No Dental coverage other than tooth extractions caused by an accident. See the sample policy for complete details on coverage and exclusions. 3. How easy is it for someone to enroll a pet? Takes just 10 seconds to get a free pet insurance quote. Takes just a couple of minutes to complete information about their pet(s) and provide us with a credit or debit card for monthly premium collection. They receive a 30-Day Money-Back Guarantee with monthly auto-billing and they can cancel any time. 4. How does pet insurance work? Pet insurance reimburses the pet parent after treatment. The pet parent takes their pet to their favorite veterinarian when sick or injured. The pet parent pays the veterinarian at time of treatment. The pet parent submits a claim to Healthy Paws. Healthy Paws sends the reimbursement check directly to the pet parent within 3-10 days. Healthy Paws will make special accommodations for large veterinary bills with the agreement of the veterinarian. We can direct pay the veterinarian and this needs to be pre-authorized and is handled on a case by case basis. 5. Why doesn't Healthy Paws offer wellness coverage? Some pet insurance companies offer wellness coverage at an additional cost or incorporate it into one of their myriad of plans. When an insurance company reimburses for â€œexpectedâ€ treatments like an annual exam, typically they will restrict coverage or payouts on the more important and higher cost accidents and illnesses to give this perceived benefit of wellness coverage. Insurance is about protecting yourself from the unexpected. Auto insurance pays for that unexpected car collision or home insurance covers the unexpected water damage or fire. These do not cover expected maintenance. If they did, premiums would be quite expensive! Pet insurance therefore should be about protecting you and your pet when they are sick or injured. Unlike wellness care, these are the conditions you cannot plan for in advance and can easily cost in the thousands of dollars. After all, no one wants to be faced with skipping an important treatment for their pet or, worse case, euthanizing their pet simply because they cannot afford veterinary care. 6. How much does pet insurance cost? Healthy Paws premiums are calculated based on your individual pet's breed, age and zip code. Cat health plans typically range from $15 and $35 per month. Dog health plans typically range from $25 and $45 per month.